Safari etiquette, field positions, shooting sticks and charging dangerous game; it's all covered in the SAAM course. If you're lucky, it happens in open ground. You have time to plant your feet, visualize the shot and wait until you're sure — but with enough cushion to shoot again if you blow it. Usually, it doesn't happen that way. More often a charge comes out of nowhere, too close, with brush in the way and bone-chilling sound effects: crashing brush, an elephant's angry screams, a cat's thunderous roars. You have just one shot, and you'd better make it good. At one time or another most of us imagine such situations, and in our daydreams we do it right: The rifle comes up naturally, we wait for the right moment, and the beast drops at our feet. Few of us ever actually face a serious charge because, realistically, it doesn't happen all that often. On the other hand, dangerous situations do occur with dangerous game. You must be ready, and you'd better shoot straight! How can you prepare for such an unfamiliar situation? This is the question the instructors at the Sportsmen's All-Weather, All-Terrain Marksmanship (SAAM) course wrestled with when creating their new SAAM Safari shooting school, held at Tim Fallon's FTW Ranch in the Texas Hill Country. I attended their regular SAAM Precision course, which stresses practical field marksmanship: getting steady in field positions, reading wind, fine-tuning and understanding your zero, and both expanding your range envelope and understanding your limitations. I was extremely impressed by the expertise and teaching abilities of Fallon and his two primary instructors, retired Navy SEALs Chip Beaman and Doug Pritchard. Since then we bounced back and forth a myriad of ideas and concepts, and in early January I had a chance to see the results. The Safari course isn't just about stopping a charge. Using the "crawl, walk, run" approach, it starts with the basics, taking students through safety, safari preparation and shot placement. The shooting portions — and there's plenty of shooting — starts with field positions, rifle drills and the use of shooting sticks, then culminates in a two-pronged approach: Using life-size targets made from photographs with inset kill zones, plains-game targets are engaged from field positions out to about 300 yards. 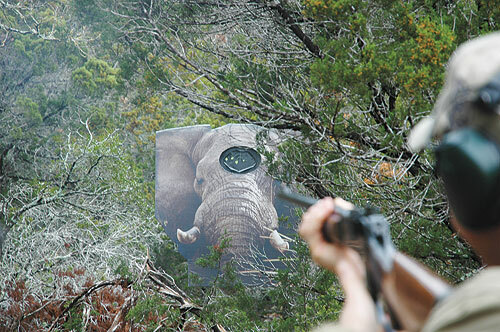 Dangerous-game targets are equally lifelike, with embedded kill zones, and are engaged in realistic situations: first shot at a static buffalo or elephant, followup shots as he runs off — or charges. This training is done both on a "clean" range and on a field course. Here you'll find some surprises: buffalo and elephant that come out of nowhere. The dangerous-game course also includes special situations: brain shots on crocodile and hippo, lion and leopard from a blind. Teaching points here include blind etiquette, how to get steady, listening to your PH (there are leopards you should shoot and others you shouldn't!) — during the course, the leopard will be shot both in daylight and at night. The four-day course is a fast-paced blend of classroom, static ranges and field courses, with students firing several hundred rounds through plains-game and dangerous-game rifles. While use of one's own rifles is encouraged, it was recognized early on that nobody can do that much shooting with a bigbore and emerge unscathed. The solution is sub-caliber options and light loads. SAAM is equipped with bolt action Ruger .223s with express sights, and light loads are available in some cartridges. The 77-page SAAM Safari Manual is a masterpiece of what to expect on safari, not just rifles, ammo and scopes, but it's also an illustrated shot placement guide, and includes health and travel tips. Lodging is first-class, as are the meals. The classes are small — just four to eight students, with the instructors prepared to gear the course to individual needs. As with the SAAM Precision course, I found it a fantastic learning experience — and also a whole lot of fun. Heck, I could shoot those charging buffalo and elephant all day long. Even with as much African hunting as I have done, I came away better prepared for the next encounter, whether it's a grysbok off the sticks at 90 yards, a leopard in a tree or a buffalo to whom I owed money. Whether you're preparing for the hunt of a lifetime or just want to have a good time and improve your shooting, I'm sold on SAAM. Be prepared to come away a better hunter.